Make your own. Use any stamp to create an embellishment for your card. It's good right?? I love it. Mary Dawn and Linda come up with some good ones I tell ya! I started by stamping the flower & floral background in white pigment ink and then heat embossing it in white. I used the heart from the the Hero Arts/Operation Write Home set "Year round sentiments" I love this stamp set and I adore this heart. I stamped it a bunch of times on white cardstock in Mowed Lawn Distress Ink, then I punched it out with a heart punch by McGill that I bought 15 yrs ago. I inked the edges of the hearts a bit and then covered them in Glossy Accents. I knew the ink would bleed and five me that lime color in the middle that I wanted which is why I inked the edges. When they were dry I arranged 4 hearts to make the clover. I used a Memory Box die to cut out the bottom portion of the card and then cut a strip of paper and inked it with Mowed Lawn and Hero Arts Soft Cantaloupe to create the Irish flag. I attached the strip behind it. The sentiment is stamped on a Frame Cut from Hero Arts. It's not what I wanted but it's all I had for "Luck" I will be changing it out for my son for St. Patrick's Day. I think the stamp set is from Inkadinkado but I am not positive. Now it's your turn. 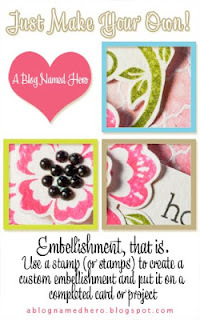 Use one of your stamps to create an embellishment for your page and make sure you link it up on the ABNH blog using the very easy Inlinkz tool. I can't wait to see what you do! 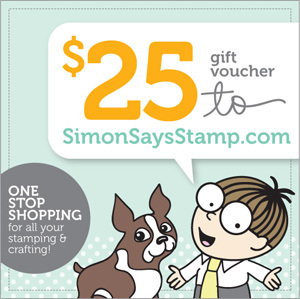 Don't forget that you have a chance to win a $25 gift certificate to the SUPER AMAZING Simon Says Stamp! I AAAAAAdore this! I love making 4-leaf clovers out of hearts.